Tiger Woods completed one of the greatest ever sporting comebacks after a thrilling weekend at Augusta National. Tiger: a large, carnivorous, tawny-coloured and black-striped felione, Panthera tigris, of Asia, ranging in several subspecies from India and the Malay Peninsula to Siberia: the entire species is endangered, with some subspecies thought to be extinct. Eight days previous, Tiger Roll made history. The first racehorse to win consecutive Grand Nationals since Red Rum in 1974. A sporting legend. A week later and another Tiger hit the headlines. This time it was Woods. From a career on the verge of extinction, a personality endangered, Tiger Woods created one of the greatest comebacks in sporting history. 22 years ago, Tiger was the head of the pack. The first of 14 majors in the space of 11 years. A maiden success at The Masters. By 2000, Woods had won all four of golf's biggest competitions. For just over a decade he was almost untouchable. A roar like no other, resonating across the globe. Yet the first sniff of personal problems and injury troubles brought the cult figure tumbling down between 2009 and 2011. A downfall created only by himself. An admission of therapy followed. Bravery. Pride at stake, he recovered quickly on the golfing plains. Tiger had restored his stripes as the number one by 2013. The first sign of his fearless nature in Woods' spiritual home. Woods: an area of land covered with a thick growth of trees: shaded from the sun, the woods were cool and quiet. Out in the wild, nature continued to fight his golfing supremacy. A quartet of back surgeries. Tiger had been thrown to the hyenas, ranked as low as number 1199 in the world only two years ago. Personal problems resurfaced. Falling asleep at the wheel of a running car under the influence of prescription drugs. Tiger was at rock bottom. Woods needed to be shaded under the protection of the trees. Those he could trust to build him up again. Could he recover on professional and personal levels? Tiger: a person resembling a tiger in fierceness, courage. Whilst Paul McGinley described Woods as a "thoroughbred racehorse" to Sky Sports viewers, Tiger simply suggested he was "plodding along". Looking to stay in the hunt and strike in the final few moments. Ala Tiger Roll. Tiger kept himself in the running throughout the entire four days. It was with just a handful of holes remaining that his opportunity surfaced. The final few hurdles. Hole twelve proved the turning point. 65 holes previous paled into comparison. Leading challengers Brooks Koepka and Francesco Molinari hit the water. Woods played safe. Experience in the wild. Tiger: an additional cheer (often the word tiger) at the end of a round of cheering. By the penultimate hole, the result had become as clear as a tiger's stripes. 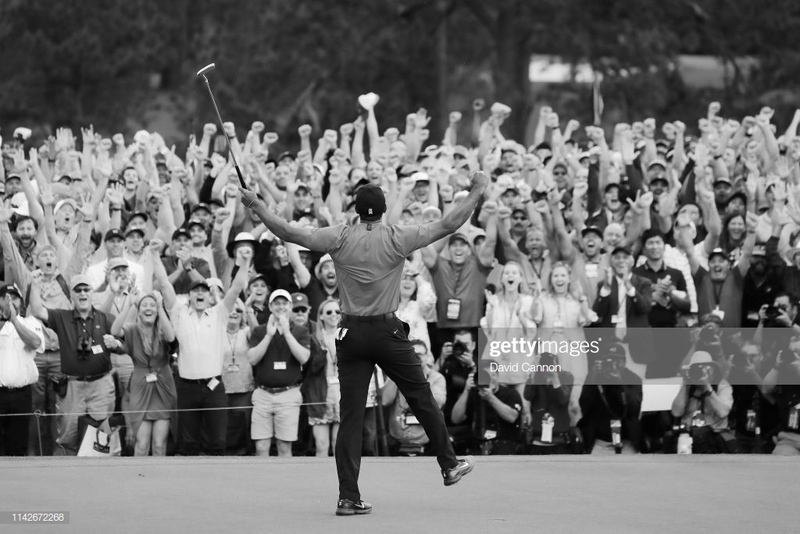 Woods was about to succeed where many thought it would be impossible. A return from the brink. A first major for eleven years after everything that went on in between. Buoyed by all those people who said "it could never be done", trainer Gordon Elliott marched Tiger Roll past the cheering crowd, arms aloft and pumping the air. It was deja-vu as Woods, who had been greeted by his father 22 years previous, took his children and mother on a lap of honour. Emotion. A tiger's roar can be heard up to two miles away. A cheer for Tiger, Roll and Woods, can resonate around the planet. The large chasing pack defeated again. Definitions from dictionary.com and Cambridge Dictionary online.